At Astrological Gem, we see time and time again how top-quality Vedic gemstones produce significant, quantifiable results for the gemstone wearer. These results are traditionally in alignment with the qualities of the planet that the gemstone represents. The gemstones for Vedic Astrology channel the frequency of the the nine Grahas, or celestial influences, as originally documented and referenced thousands of years ago when the study of Jyotish (Vedic Astrology) began. We will explore the significations of these grahas, and their corresponding gemstones, below. The Sun is the planet of life force. In the most literal sense, the Sun is the source of vitality. The Sun is also directly related to one’s highest sense of self, and the highest sense of father figures. In religions all over the world, the Sun is depicted in this way, representing authority and divine potential. Corresponding Astrological Gemstone: Ruby. When Sun is a beneficial influence the Jyotish chart, it can be strengthened with a Vedic Ruby. (Red Spinel and Rhodolite Garnet are secondary choices.) The anticipated benefits include increased brightness, brilliance, fame, respect as an authority figure, integration with the divine and the highest sense of Self, benefit to father figures, and personal power. Like the Sun, Moon is also directly related to the Self. Moon, though, is the physiological self. The Moon signifies our emotions – it is watery, changing, cyclical energy. The Moon also relates to mother figures, and our higher intuition. Corresponding Astrological Gemstone: Pearl. When Moon is a beneficial influence in a Jyotish chart, strengthening it with a Vedic pearl leads to emotional balance, peace, intuition, benefit to mother figures, benefit to home life, and sometimes benefit to vehicles and transportation as well. Strengthening the Moon is frequently described as soothing, calming, and balancing when achieved by wearing a top-quality pearl. Mercury directly relates to the mind, and to communication. It is the planet of words, speech, business transactions, numbers, travel, and humor. Corresponding Astrological Gemstone: Emerald. When Mercury is a beneficial planet in a Jyotish chart, it can be strengthened with a Vedic Emerald. (Green Tourmaline and Peridot are secondary choices.) The reported benefits of a powerful emerald usually revolve around clarity – better communication skills, enhanced speech and writing, and clearer thinking are commonly experienced results. It is said to enhance business success, sense of humor, efficient travel, and rapid processing of information. Mars is the planet of physical endurance, assertiveness, courage, and overcoming battles. Because Mars is associated with war, it is considered one of the natural malefic planets in Vedic Astrology. However, it can also be helpful for certain Jyotish ascendants. Corresponding Astrological Gemstone: Red Coral. If Mars is a beneficial influence in the Jyotish chart, strengthening Mars by wearing a Vedic red coral can lead to an increase in vitality, motivation, strength, courage, athletic ability, power, and victory. Venus is the planet of love according to Vedic Astrology. It also overlords creativity, fine arts, beauty, gemstones, jewelry, luxury, romance, marriage, the reproductive system, opulence, and refinement of the senses. Corresponding Astrological Gemstone: Diamond. If Venus is a beneficial influence in a Jyotish chart, it can be strengthened with Vedic Diamonds. (White Sapphire, White Zircon, and Phenakite are secondary choices.) The anticipated results include healthier relationships, increased creative potential, more luxury, and more personal refinement. Venus also signifies the health and well-being of the wife, and women in general. 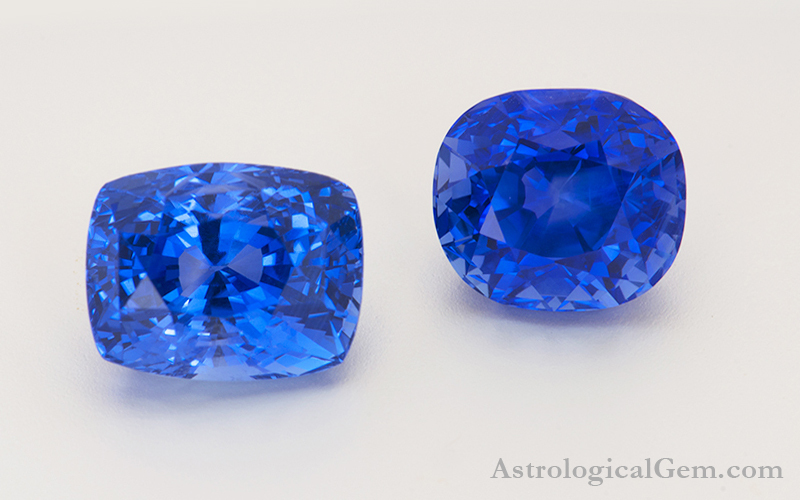 Corresponding Astrological Gemstone: Blue Sapphire. If Saturn is a beneficial influence in a Jyotish chart, it can be strengthened with a Vedic blue sapphire. (Blue Spinel, Iolite, and Amethyst are secondary choices.) Strengthening Saturn can increase focus, discipline, work ethic, routine, organization, commitment, and follow-through. Saturn in its auspicious form represents some of the highest qualities of humanity, such as spiritual practice and long term self-discipline. Saturn rewards us greatly when discipline and humility are actively practiced, and blue sapphire is said to increase commitment to these areas of self-betterment. Jupiter is considered one of the greatest benefics, or beneficial influences in Vedic Astrology. Where Saturn is often associated with constriction, Jupiter is associated with expansion. Jupiter represents the benevolent, generous side of humanity. Known as Guru in Sanskrit, it is signified as great wisdom, enlightenment, abundance, happiness, and spiritual mastery. Corresponding Astrological Gemstone: Yellow Sapphire. If Jupiter is a beneficial influence in a Jyotish chart, it can be strengthened with a Vedic yellow sapphire. (Yellow topaz and citrine are secondary choices.) This will promote wealth, expansiveness, education, wisdom, health of children, enlightenment, fortune, education, and generosity. Jupiter also signifies the health and well-being of husband figures. Rahu and Ketu are not actually planets, but technically, mathematical points in space. They are responsible for eclipses, which may be why they are commonly referred to as “shadow planets.” Rahu and Ketu are equal and opposing forces, orbiting the astrological chart in direct aspect of each other, sometimes creating havoc when they are active in transit or prevalent in the Jyotish chart. Rahu signifies material goods, deception, fame, intoxication, and attachment. Corresponding Astrological Gemstone: Hessonite (Gomed). Strengthening Rahu with a powerful Vedic Hessonite, at its best, promotes fame and wealth. Some choose to wear it for protection. We believe that this gemstone may produce side effects if not carefully prescribed, especially if one is not in a Rahu mahadasha (planetary period), so we recommend verifying the anticipated results carefully with your Vedic Astrologer before wearing. Ketu is the south node of the moon, and signifies enlightenment, liberation, spiritual development, non-attachment, and non-material/invisible influences. Corresponding Astrological Gemstone: Cat’s Eye (Chrysoberyl). Strengthening Ketu with a powerful Vedic Cat’s Eye, at it best, will promote spiritual development, higher knowledge, transcendence, and connection to the divine. We believe that this gemstone may produce side effects if not carefully prescribed, especially if one is not in a Ketu mahadasha (planetary period), so we recommend verifying the anticipated results carefully with your Vedic Astrologer before wearing. Further benefits and significations of Astrological Gemstones can be determined on a case-by-case basis, by looking at the individual Jyotish chart of the wearer. You can view our complete astrological gemstone collection here. Could you please recommend me what sort of GEM stone should I wear born on 05/11/1957 at 11;30 am Indian time. Astrological Gemstones and their meanings. I have become really intrigued by Astrological Gems lately, and interested in learning more and more about the benefits and their effects. In my understanding, Astrological Gems should be carefully selected with consultation of a good Astrologer and a Graduate Gemologist. Previous Post Who is Jay Boyle? Next Post Can I wear this diamond?